To practice hand dribbling skills and to build cooperative strategy skills. Some ball control ability to dribble with one hand or bounce with two hands. 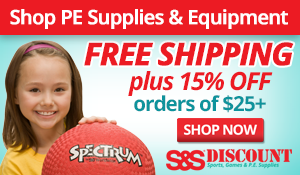 Intermediate sized basketballs (or rubber ball that bounces) for every team of students; 1-2 foam building blocks or 1-2 various pieces of equipment (e.g. Frisbees, poly spots, foam noodles, foam dice, foam sticks, foam paddles, etc) for each student. Designate areas for teams to build their own structures or artworks (inside a hula hoop or inside a 2 jump ropes, etc). Have students gather in small groups of 4-6 in their designated building area of the gym. Place foam building blocks in buckets or hula hoops in the center of the gym. Alternatively place various pieces of gym equipment in the center. Have each team select the type of ball they prefer to dribble by hand. On the teachers signal to begin, 1 member of each team dribbles to the center of the gym to pick up a foam building block or piece of gym equipment. The student continues dribbling with the block/piece back to the team’s designated area of the gym. The other students are practicing dribbling in place while waiting for other dribblers to return. Each team chooses 1) what they would like to build, 2) what pieces they will need and 3) who they will send to get them. While the students are dribbling to gather building materials the teacher can observe students’ abilities to dribble and how fairly the students cooperate in each team. Building concludes on teachers’ timed signal. Submitted by Schuyler Antane who teaches at Hawk Elementary School in West Windsor, NJ. Additional authors for this idea were Cooperating teacher; Nancy Massari. Thanks for contributing to PE Central! Posted on PEC: 3/19/2012. Viewed 116374 times since 3/10/2012. I love this game and all of my students love it to! I do this version for K-2, and then 3-5 I change it a little with the rule that they must keep dribbling the entire way down and back in order to pick up a building piece or they have to return it to the center, and also each group tries to build the "tallest tower" and at the end of the round the groups with the tallest towers get a point, and they I restart the game for another round. Works great!! Thanks for the idea of PE. Now I have got some other ideas because of this.